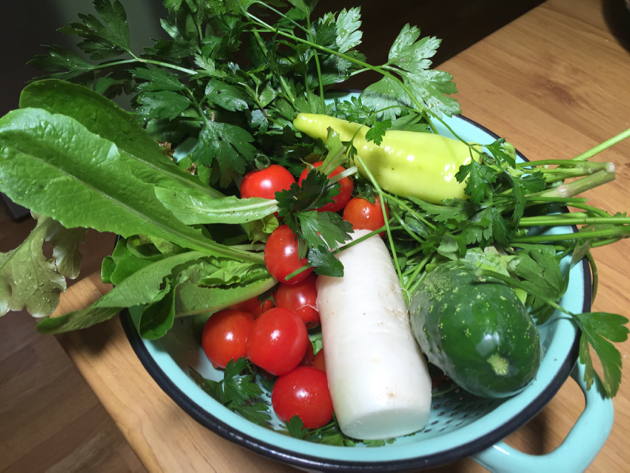 The makings of a salad picked fresh from the garden during the week. Usually I make a ritual of sitting down to watch the first ball bowled of the first cricket test. Then I sit there on and off throughout the day, knitting and watching. That test started yesterday and I forgot it was on! I used to have an excellent memory so I feel its loss deeply, especially when I forget something I've done for many years. It's one of the downsides of ageing that I'm still getting used to. I don't forget a lot of things but when it's the cricket, pfttttt! I'm not happy. I was busy all day yesterday because Jamie was here and we had the extended family over for dinner. So today, I'm having the day off. Today I'll watch the second day of the test match, I'll sew my Maggie rabbit and I might even pretend it's yesterday. ;- ) I wonder what you'll be doing. See you next week, friends. Middlebrow? What's so shameful about writing a book and hoping it sells? Your salad looks fab. Enjoy your cricket. Good morning Rhonda, For me summer is sewing with the cricket on the radio. And so it was yesterday. Hope you enjoy the test series. Ahhh, the early teen birthday parties. I have fond memories of them. And yes, they like to eat. lol Thank you, Lors, enjoy your weekend too. I'm glad to hear you've had a good week, Rhonda. This time of year can get very busy! I don't think your age is letting you down at all! At the grand old age of 23 I managed yesterday to forget my keys and lock myself out of the house, and forget my turn off and miss my exit. I like to think of memory more on a continuum, it ebbs and flows depending on the other things we have in our lives and is very personal. As long as you had a great day with family, to hell with the cricket! (Ha). I don't often comment, but I just wanted to say I really enjoy your weekly reading lists. I read the Guardian too and never seem to find such good articles! This may be a silly question, but what is that white veg in the middle of your salad fixings? It's a daikon radish, Helena. We grow them primarily for Sunny to make her kimchi but I occasionally grate one for a salad.